In 2014, the movie Paddington was released. Based on the children’s book series created by Michael Bond in 1958, it is about a talking bear cub who makes his way from the jungle of Peru to London and is taken in by the Brown family. Many lighthearted adventures ensued. It was very charming and occasionally quite funny and Paddington himself is an immensely likable character. 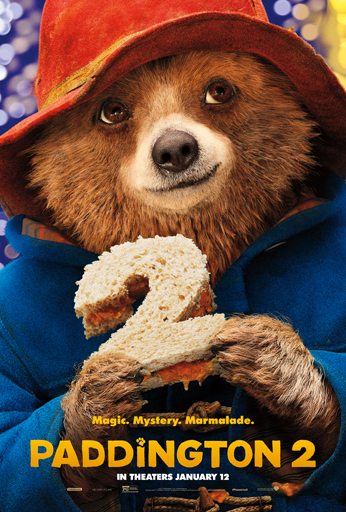 Now comes Paddington 2 which is not quite as good, but replicates a lot of the qualities that made the first one so enjoyable. In the sequel, Paddington (voiced by Ben Whishaw) is now a full-fledged member of the Brown family, which includes writer mother Mary (Sally Hawkins), nervous Dad Henry (Hugh Bonneville), aspiring reporter daughter Judy (Madeleine Harris) and son Jonathan (Samuel Joslin), who is trying to fit in in high school. 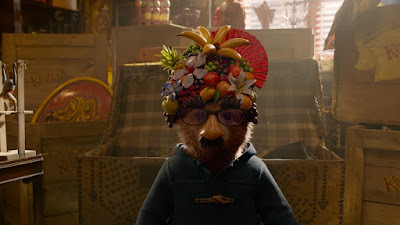 As shown in the first film, Paddington was raised in Peru by Aunt Lucy (voiced by Imelda Staunton) and the late Uncle Pastuzo (voiced by Michael Gambon). As this film starts, it is nearly Lucy’s one-hundredth birthday and Paddington wants to get her something special. He visits his friend Mr. Gruber’s (Jim Broadbent) antique shop, where he finds the perfect gift: a pop-up book of London. Unfortunately, it is very expensive, so Paddington takes on a series of odd jobs to make money, which leads to wacky adventures as a barber and a window washer. It also brings Paddington and the book to the attention of struggling actor Phoenix Buchanan (Hugh Grant), who has his own reasons for wanting the pop-up book. Much of the appeal of these films comes from Paddington’s guilelessness and staunch belief in the inner kindness of everyone he comes across. He charms nearly everyone he comes across and brings out their better qualities. He does not have a mean bone in his body and, as a result, neither do his movies. They are pleasant, likable and surprisingly clever. Much like the first one, Paddington 2’s screenplay (by Simon Farnaby and director Paul King) is pretty smart in the way it sets up gags early in the story and pays them off during the climax. They will introduce something that seems like a one-off joke and then bring it back for a bigger laugh later in the film. They do not rely entirely on the cuteness of their lead character to entertain their intended family audience. And they do not dumb things down for kids. Paddington 2 has a bunch of sight gags, but never resorts to slapstick or gross-out humor. It also has a solid message (it essentially breaks down to “be nice to people”). I did not find anything here to be laugh out loud funny, but I chuckled a few times and smiled through much of the film. What it comes down to for me is that Paddington himself is just a really lovable character. I enjoy seeing him get out of his predicaments using kindness and a polite ingenuity. There is nothing groundbreaking here. It is just a nice movie about a nice little bear who makes the people around him nicer, while the selfish get their comeuppance.